Gosh – it sure has a busy week around here. I’ve been in the kitchen baking pretty much everyday – rolls, bread, pitas, and this delicious coffee cake. This blackberry version has long been my favorite, but when I came across this strawberry-cream cheese version on Pinterest I couldn’t wait to try something different. I also happened to have everything I needed right on hand, as I had some strawberries in the refrigerator that were on their last leg and needed to be put to use in something. 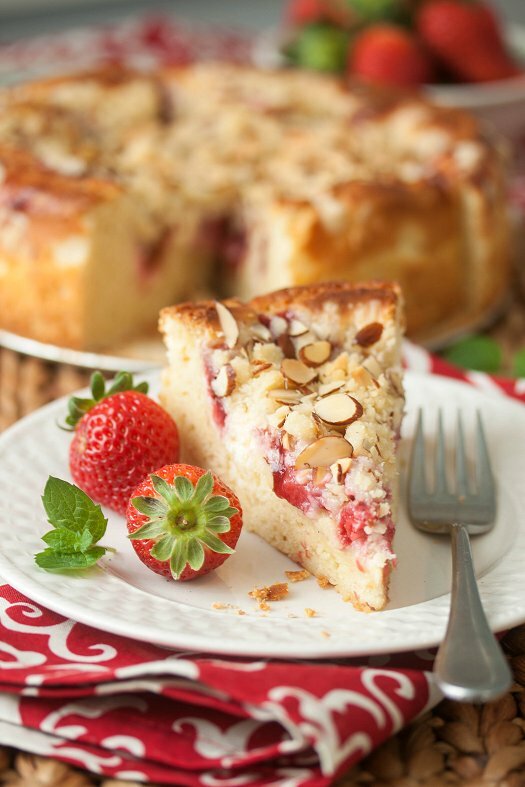 The cake batter comes together quickly, then you top with a simple cream cheese mixture and a quick homemade strawberry jam using fresh berries, then it’s all topped off with a delicious almond streusel. The cake was tender and sweet, and the layers of toppings from the cream cheese and strawberries just made it totally rich and decadent. Not to mention how beautiful it turned out! It would be a show stopper at a Sunday morning breakfast or brunch for sure. Or, just to bake on an idle Friday night and have around for nibbling on all weekend long. We’re looking forward to a family trip with our crew, as well as one of my best friend and her family to Ocean City. We’re heading to a restaurant we’ve been dying to try, The Shark on the Harbor – and then it’s on to The Annual Waterman’s Expo! A trip to the boardwalk and Thrasher’s might also have to be in order…you know, for the baby. Then on Sunday, football of course. Still trying to decide what munchies to make. I’m thinking a big dish of roasted Seahawk is definitely on the menu. Heh. GO NINERS! I hope that everyone has a great weekend! Preheat the oven to 350 degrees. Lightly grease and flour and 9-inch springform pan and set asdie. To make the strawberry jam, combine the cornstarch and water in a small bowl to make a slurry. In a small saucepan, combine the strawberries and sugar. Cook over low heat for about 5 minutes, or until the strawberries release their juices. Add the cornstarch mix and stir until well combined. Stir for another minute or two until it has thickened. Remove from heat. Let cool to room temperature while you prepare the rest of the cake. Beat the cream cheese on medium speed for about 30 seconds until smooth. Add in the sugar, egg, and vanilla and beat until well combined. Set aside. To make the crumb topping, combine the flour and sugar in a small bowl and mix to combine. Pour in the melted butter and mash with a fork until the mixture is crumbly. Set aside. To make the cake, combine the flour, sugar, baking powder, baking soda and salt in a large bowl. In a 2-cup measuring cupl, whisk together the eggs, sour cream, yogurt, and vanilla until well blended. Make a well in the center of the flour mixture and pour in the liquid ingredients. Fold together gently until evenly combined and no streaks remain, being careful not to over mix. Pour the the batter into the prepared pan in an even layer. Carefully layer the cream cheese layer on top of the cake batter, as well as the strawberry layer – spreading out evenly. Top with all of the crumb topping, and then sprinkle with the sliced almonds. Bake in the preheated oven for about 50-60 minutes until cake is set and nicely browned on top. Remove from oven and let sit for 30 minutes before removing from springform pan. Let cool for at least another 30 minutes before serving. Ai, ai, ai mais uma tentação. Quando chegar a casa tenho mesmo que ir fazer um docinho. Oh yeah – this is right up John’s alley! I think I’ll make it with some raspberries I still have sitting in the fridge 🙂 he would love it. This is one lovely coffee cake! I’m going to make it for a ladies brunch next week. Thanks for the recipe! This looks heavenly! I love that the cake uses Greek yogurt, and that crumb topping with the almonds looks like perfection! Delicious!! i love coffee cake. this sounds delicious! I am suuuuper excited about this. Stunning pictures!! This makes me so hungry!! Thanks for dropping by my site, yours is beautiful. Looks great, but your directions call for lime zest and baking soda, neither of which are listed in your ingredients list. I can wing it, but you may want to review. Thanks, Justine. I’ve corrected the errors!